Showing items in category New Brunswick, sorted by newest listed first. NEW BRUNSWICK - 1849 outer wrapper to UK cancelled ST.JOHN NB/PAID. 1849 (MR.17.) 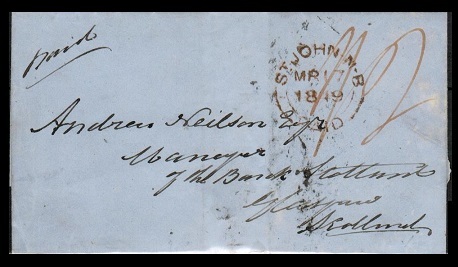 outer wrapper addressed to Scotland marked 'Paid' in manuscript and rated '1/2' and struck by red-brown double arc ST.JOHNS N.B./PAID handstamp. NEW BRUNSWICK - 1853 stampless entire to USA used at ST.JOHN'S. 1853 (FE.8.) 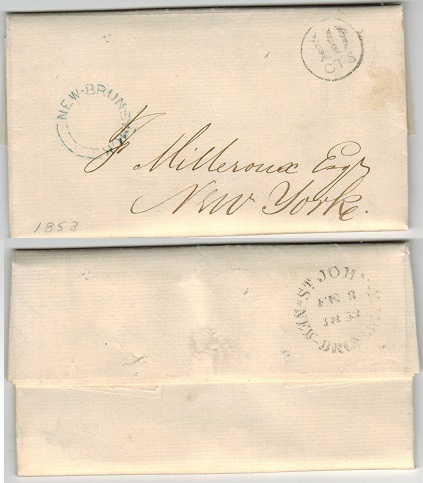 entire addressed to New York cancelled by ST.JOHNS/NEW BRUNSWICK b/s with circular '10/CTS' rate h/s on front and double arc NEW BRUNSWICK strike applied in greenish ink. 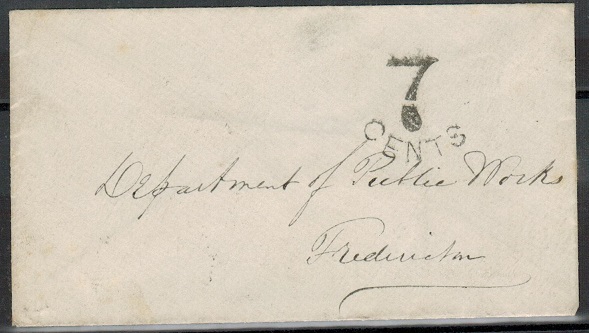 NEW BRUNSWICK - 1864 stampless local envelope struck 7 CENTS with FREDERICTON arrival b/s. 1864 stampless cover addressed locally & struck on the front by 7 CENTS h/s in black (RL type 30 - without 'Paid'). SAINT JOHN/N.B. b/s dated SE.7.1864 with FREDERICTON/N.B. arrival.